Gmail users can now put people on hold and field multiple phone calls, right from their account. Making phone calls from a Gmail account is nothing new -- the service was introduced last August and has been popular ever since. But Google released an update to its calling feature inside Gmail that will let users make (and take) multiple calls at once. Google announced the update Wednesday evening on its blog. 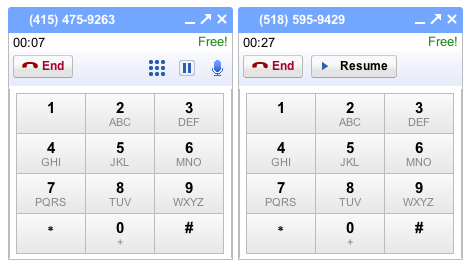 Here's how it works: All you have to do is make (or take) a call through your Gmail account. Then, if you want to make another phone call or take another call, your current call will be put on hold while you talk to the second person. You can switch between the conversations using the "Resume" button. Unfortunately, you cannot talk to both people at once. You're now also able to put any call on hold, whether you have a second (or third, or fourth) call or not. The new feature works with video, voice, and phone calls, but you're restricted to making two physical phone calls at once. This update is nice -- it's certainly useful to be able to take more than one phone call --but what we really need is the ability for conference calling or video conferencing. I know Google has the capability to make that happen, because I see it in Google+.